We cannot thank everyone enough for the thoughts and prayers we have received in the last few days for the girls. I had nearly 200 emails when I sat down this morning and about a quarter of them were well wishes. So, I'll start out with the easy stuff. Izabel is doing much better with whatever bug she had. We are down to a cough that continues to linger. It's still pretty junkie and as of today she is coughing so hard she makes herself sick. It's nothing major but I do hope the cough goes away soon. She remains slightly warmer than her usual self but no more high fevers. She was such a good girl yesterday and stayed with her Uncle Doc while we tended to Princess Emmy. Emily is doing good today. Considering the weekend she had, good is as great as ever. Emily battled her cold/viral ickyness most of the weekend. Her fevers were high and her usual temperament was nowhere to be found. She was started on her antibiotic and we kept up the Tylenol so we were keeping her comfortable. Sunday evening, I was getting dinner ready. I put Emmy in her seat first because she was clearly more hungry than the rest of us. Emmy was moved to a booster seat at the table a few months back because she simply would not cooperate with the high chair. The booster seat is attached to the dining room chair and Emmy was strapped in to her booster seat. I walked 5 feet from Emily to grab her plate and when I turned around, Emily pushed off from the table and tipped the chair and booster and herself back onto the floor. I couldn't catch her in time. She cried out and I was right there trying to unstrap her and pick her up. She only cried for a few moments and then appeared fine. She did cut her head on the back side but it wasn't as bad as it could have been. I called the doctor who said to bring in her to be looked at and evaluated for a concussion. We went Sunday evening and everything checked out great. The cut was just a scratch and she was happy as can be. We came home, played, ate a little bit and went to bed. Monday morning dawns and Emily wakes up crying non stop. This is unlike her. She waskes up happy as can be and ready to start her day. So I hold her and we sit on Izzy's bed and try to distract her. Nothings working and she just seems so tired. She doesn't want her cup she just wants to cry and be held. All of a sudden, Emily starts vomiting. Not of projectile sorts but a gush. Over and over again. And then...she passes out. I continue to hold her even though we are both soaked in goo. She comes to a little bit and opens her eyes, only to vomit again. And then...She passes out again. 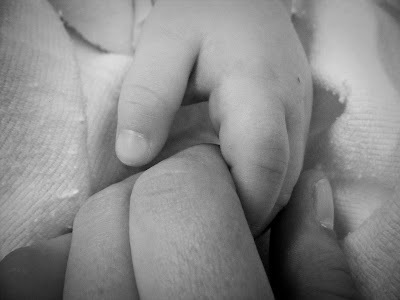 So I hold her a little longer and then decide it's time to go. I lay her down on Izzy's bed and Izzy sits next to her. Emily is still "out". She's breathing normally and appears only to be sleeping contently. I am okay with the situation so I grab the phone and call hubby to come home so I can have the car. We are in the car and on our way to the ER with 30 minutes of the begining to all of this. We arrive at CMH hospital and our wait begins. I'll spare you all the waiting details as I know I am not the only one to have waited longer than we should have. By this time Emily was alert and awake. She was not during the car ride there. It's nearly 5 hours since we arrived that we finally get into Radiology. Not only is Emily very upset and hungry but she is tired. We walk into the CT room and Emily is not the least bit excited about the amazing set up they have going for her. Not.One.Bit. 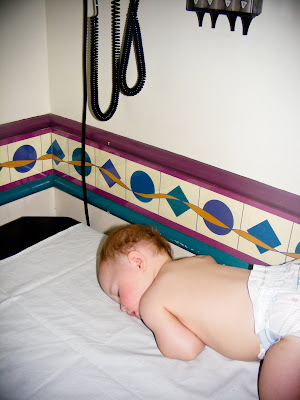 I'll spare you the details of trying to get an 11 month old to cooperate for a head CT. We tried 3 times before Daddy and I made the decision that she should be sedated. After all, we were all in agreement that even though she checked out fine, we wanted the CT.
Insert an additional 3 hour wait for sedation and CT. In all fairness, because Emily would be going under, we had to wait for a room to open up. Once she was admitted to a room they could put 2 nurses on Emily and only Emily. She had to be closely monitored for the whole procedure. Emmy is a fighter, literally. She is so strong. It took 3 people to hold Emmy down for an IV. Once that was in, it took 30 seconds (or less) for the sedation medication to work. We get her stable and hooked up to her mobile unit and moved her to Radiology, where the 5 minute CT scan was completed. Now comes the tricky part. 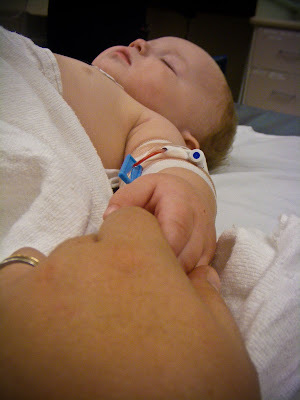 We were sent back to our recovery room where we began the scary task of waking Emmy from sedation. Simply put, Emmy's nurses said 20 minutes was the standard amount of time for them to come out of the sedation. 10 Minutes goes by. The nurses are monitoring her at bed side. Another 5 minutes goes by and Daddy and I are trying to talk to her and wake her up. 20 minutes is up and Emmy is still very much sedated. We are begining to wonder and keep asking the nurse if this is normal. Sometimes it is I guess. It took Emily nearly an hour to wake up from sedation. It was a long hour and I don't think my heart ever beated as rapidly as it did. I tried not to worry but in the back of my mind I was. In conclusion, Princess Emily is as healthy as can be. No fractures to the skull and no bleeding in the brain. She has a mild concussion that will pose no threat to her. Vomiting after a head fall is common. It happens. The wait at CMH is frustrating sometimes but Daddy and I both wanted these procedures done and we are more than happy to have Emily cleared of any danger. So if you are still with me here at the end, congrats! I know that was a long entry, but it's more for me to remember the incident. Emily is still to be watched and she is to continue her antibiotics. Both the doctor and the nurse called this morning to check on Emily. How cool is that?! They were pleased to see that she had such a good night and morning. She's all smiles today and has had very little protest to anything. I certainly hope that both of our Princesses are back to being healthy very soon. And to think, Daddy and I will have to endure yet another sedation procedure in 10 days with Princess Izzy. I am so glad to hear that everything is better. That can be so scary, but it sounds like you had great doctors and nurses with you every step of the way. Not to mention God watching over your sweet angel. You certainly made the right choice to go to CMH. I wouldn't take my three boys anywhere else. With that said, I'm so glad she is okay. I know that must have been terrifying for you to witness. I will pray that she has no more complications with her mild concussion. What a scary day for all of you. I’m so relieved to know Emmy’s going to be fine. that is SUCH good news! the blog entry will serve as a great reminder, so will the pics. hugs to you and your girls! Did you hear that big sigh of relief from everyone out here? I'm bordering on speechless. What an ordeal for everyone. It can be so frightening when something like this happens -- especially to a little one who can't tell you where it hurts. I'm relieved to read that things are okay. We haven't been to the hospital with any of our kids for a very long time, but I remember the feelings of helplessness and uncertainty. My wife does so much better with emergencies than I do. I guess I wasn't as speechless as I thought. I'm new to your blog and I just read this post. How frightened you must have been. Bless your heart. I'm so glad your baby girl is okay. Oh goodness! I think I held my breath throughout that entire post. I just saw this, my heart goes out to ya'll! I'm so glad to hear that both of your girls are doing better. I am so glad to see that all is well! Thank you so much for the update! Wow, what a long day that must have been. I am glad that nothing serious was wrong and that she is doing much better. How scary that must have been. Wow - you've been through a lot lately. Praying for you guys - and glad that she's okay. I'm impressed you stayed so calm. I wouldn't have been so brave I don't think. I hate head tramas. I'm very glad Emily is better and I hope she doesn't need to go to the hospital again for a long time. Why is Izabel being put under? Is this teeth related? Wow, that all sounds incredibly scary and traumatic. Glad to hear she's ok!!! I have been through this before with my son Jackson at close to the same age, only he fell down 7 concrete steps and had a huge hematoma on the forhead. It is a very scary thing that is for sure. I'm glad she is well and no major damage! Again, PTL!!! I did cry reading this. The pictures are so sad. Oh my God, honey! I would have been freaking out. Taking her in right away was the right call and I'm so glad she's okay now. Oh my goodness; what a weekend! I would have been freaking out too after the vomiting and then passing out! And then again when it took her an hour to come out of sedation; I can't imagine what you were going through! I'm so glad it was only a mild concussion and hope both girls are feeling better soon! I experienced a similar problem. When I bought my iPhone, I first checked with “Got Reception?” (Gotreception.com) It’s a great resource for finding out where reception problems are most likely to occur BEFORE you lock yourself with a specific carrier. Yes that was a scarey situation and I am so glad you are on the other side of it and that all is well! Thank you for sharing this post, the pictures were frightening without knowing. Sometimes the tests are as bad as the problem. My daughter fell out of her walker (20 yrs ago) and hit her head. Scared us to death! Her birthday will truly be a celebration!! Oh my goodness how scary! I would have been terrified. Kennedy absolutely HATES the CT machine and I don't know how they can expect small kids to lie still for it. I'm glad they were willing to sedate her. I'm SO glad she's ok!! !